The business accelerator definition is a program that includes mentorship, education, and typically a “demo day” where companies are able to pitch their business to the business community. This business community is typically comprised of potential vendors, investors, partners, and customers. Start ups, early stage companies, or subsidiaries of existing companies participate in business accelerators to accelerate their sales, operations, and financials. Business accelerators are either publicly or privately funded. Publicly funded accelerators are funded by the government. They typically do not take any equity. But they generally focus on a specific industry – including biotech, fin tech, med tech, and clean tech. Whereas privately funded accelerators are funded by private entities. Because there is a higher risk for the investors, they typically take some equity or provide capital as debt. Regardless of the type of business accelerator, it’s important to note that they are highly competitive. Application processes are usually extensive as each accelerator needs to protect their reputation – the companies they “pump” out. As an introvert, business accelerators can seem daunting, but it is great networking place! Click the button to download our Networking for Introverts Guide. The purpose of a business accelerator or accelerator programs is to grow young companies by nourishing them with the support, connections, and knowledge they need to be successful. Many times universities will have an accelerator program to monetize the intellectual property created. Likewise, governments will host these programs to fill a gap in their initiatives. Should You be a Part of a Business Accelerator? Now that you know what an accelerator can do for you, should you be a part of an accelerator? It all depends on the size of your company, whether you need further mentorship and coaching, and if you are preparing for a round of financing. Many of our clients don’t realize how valuable mentorship and coaching until they become coaching participants in our Financial Leadership Workshop. Mentorship and coaching can help further your network, your product, your process, and your brand. They provide a non-filtered, un-biased support that, while may sometimes be harsh, will help further your company. If you are preparing for your Series A, seed capital, venture capital, or angel investment, it’s important that you see all your options. As more companies are starting up, you will see the investor pool growing. Just because you know only one Angel investor now does not mean that is your only option. Accelerators help connect the right investor for your company to you. One question we get often is, “what’s the difference between a business accelerator and a business incubator?” A business accelerator can often last anywhere from a couple weeks up to a year. Whereas a business incubator holds companies from a year up to several years. An incubator’s goal is to develop a successful company, so until they are ready to fly, they continue to incubate them. 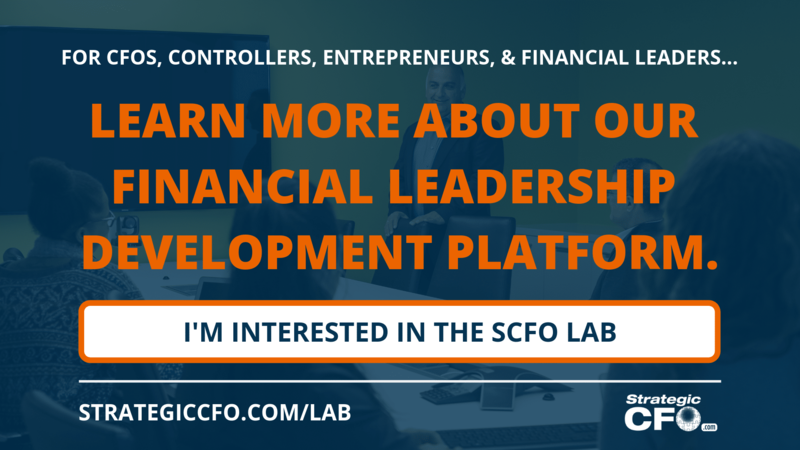 Need guidance in networking and taking advantage of your business accelerator experience? Download your free Networking for Introverts guide and start building your network today. This past week, one of my clients met with a banker to develop a new banking relationship. He hands the banker the company’s financial statements, expecting the banker to look at the income statement. Instead, the banker flips to the back of the financial statements to look over the balance sheet. As the coach, I asked my client, “See what he just did?” Most financial leaders (and the owners of their businesses) are consumed with their income statement but the banks want to know are more interested in how leveraged their banking client is. Not surprisingly, there are a few key elements when seeking financing for companies to follow. Every company cycles through good and bad times. Depending on what part of the cycle your company is currently in, your banking relationship may be influenced. There are some key elements when seeking financing that will keep you on the good side of your banker. Identifying your KPIs is a critical piece of the process when seeking financing. Want to find your KPIs and learn how to track them? Access your free KPI Discovery Cheatsheet today! What is leverage? Financial leverage is the use of borrowing from the bank to offset the cost of sales. Many companies hope to borrow just enough to increase their capabilities to sell more. But if banks see that you are too highly-leveraged, it’s bad news! As a key element when seeking financing, leverage is important to have as it provides credibility to your borrowing experience. A banker will see that you have maximized the potential of previous capital to increase sales. The “kicker” here is if you have failed to optimize the borrowed capital potential, then the bank is going to be more prone to backing out of (or not starting in the first place) a banking relationship with you. We say it often and we say it loud… Cash is king. Without cash and/or liquid assets in your company, the bank is going to turn its nose up at you. Be sure to communicate the availability of cash in your company. For example, if a friend asked you for $250,000 but had no way of paying you back, you would be wary and decline the ask. This is because there is no hope that you will get the money back that you loaned. The bank acts in its best interest. Make it easy for the bank to make a decision. Communicate through the financial statements (especially the balance sheet) the availability of cash. Oftentimes, business leaders think that the bank cares about the price of your product. They don’t. To the bank, price is the least important factor in their assessment of your company because money is a commodity to them. Price is immaterial. When meeting with a banker, communicate the bottom line and what’s on the financial statements NOT how you price your product. The bank is not your business consultant. They have to make money off of you. When seeking financing, it is essential to create a banking relationship. You wouldn’t get married to the person you passed by on the sidewalk, so why would you get into a banking relationship with someone you have zero connection with. There are a few things that you need to look for to have a successful banking relationship. If you are just starting out in a new city or have no relationships with any bankers, one of the first things that you can do is connect with people that do! For example, as a consultant, I have multiple relationships with various banks. When one of my clients needs a banker, I make the connection. People love feeling like they have it all, so give them the benefit and ask for help. Look at the bank for their philosophy and how they take care for their customers. In addition to philosophy, look at their morals. How long is a typical relationship with your customers? What are the communication boundaries? What is the bank’s view of breaking debt covenants? Another important question you need to ask yourself is: “is this bank looking for a relationship or a transaction?” If you answer the latter, then you are just commission to them. When times are rough, you’re going to get cut. But if the answer is a relationship, then you’re looking at a long healthy marriage. Relationships are absolutely critical in business. Value these relationships and take care of people. It will reflect in your business. How does the bank deal in times of crisis? A few years ago, I had a client that went through a period of stress. In the last quarter of their fiscal year, the business was growing and was doing well. They had 4 quarters of decline, but had tracked their KPIs. Although they had broken a few debt covenants, they were tracking their progress carefully with the bank. This client had a strong relationship with their bank. Without that relationship, the bank would have taken my client to the “workout” group. Don’t have KPIs to help your banking relationship? Learn how to identify your KPIs and how to track them with our free KPI Discovery Cheatsheet. Click here to download your cheatsheet! When you stub your toe, how does your bank react? Are they willing to let you slide on debt covenants for a few quarters as long as you have a plan to get out of the downturn? Often, people don’t see the importance of knowing how your bank is going to react in times of crisis. The economy continually ebbs and flows, changing for good or for bad. Also, how does the bank deal with growth? You need more financing, but you are breaking covenants. Are they willing to provide financing with the knowledge that things won’t pick up immediately? Several years ago, the bank wanted to meet with another of my clients because they had broken their debt covenants. The client calls me after meeting with “great news”! He said that the Bank had offered to work out his problems in the workout group. This “workout” group isn’t to work out your problems and put you back on track. It’s to work you out of the bank. This is not a good thing. You don’t think your house will ever burn down, but what happens if your house does burn down? You don’t think you need a bank to weather the storm, but what happens when you need the bank to weather the storm with you? Assess whether or not your current banking relationship will be your insurance in the case of a fire or storm. One way to do this is to look at the bank’s philosophy of business and their internal culture. How tight are they with the rules? Are they willing to stretch a little on their debt covenants and step up to help in times of distress? My client’s bank was unwilling to stretch its debt covenants. Instead the bank just wanted to wipe their hands clean of my client and move on to the next sale. This willingness to be flexible all boils down to relationships. I have to warn you though, not every bank is similar in their goals. To prevent being put into the “workout” group, it’s crucial to start out on the same page. Get an alignment of interests, philosophies, culture, and anything else that would impact your company. If the bank is only interested in their bottom line, then it may not be a good fit. If the bank is truly invested in your company and is willing to help you out in any reasonable way, then it’s a perfect match. As I’ve built The Strategic CFO, it’s been a priority of mine to create relationships with bankers as they are going to reap the benefits of my clients doing business with them and I value their expertise. As a result of our mutual interests, the bankers in my network continually push potential clients towards my consulting practice. Those bankers and I have a strong relationship where we understand each others’ needs and desires as well as feed each other. Of course though, I have had bankers tried to take advantage of my generosity and not return the favor. As a result, those relationships did not last long. It’s all about getting ones’ interests and philosophies in line. Banks monitor your debt covenants. To help them (and you) out, identify KPIs that influence debt covenants to help track where you are and where you’re going. Picture this, your significant other or spouse comes home and lets you know that they’ve purchased a house, car, and boat without ever discussing it with you before. If you’re like me, I’d be surprised and would want to control the situation. If your significant other continues to make extravagant purchases or decisions without your prior knowledge, you would have trust issues and may want to cut up their credit card while they’re sleeping. People see banking relationships as far-off and a different type of relationship. But the truth is, it’s all the same. Relationships are relationships. If you or your company or your significant other continues to create negative surprises, it’s not going to help with the relationship. First, fix the problem before it becomes an issue. As soon as you see a yellow flag, jump on it! Then after you fix it, let your bank know what has happened and how it has been resolved. This not only comforts the bank but builds trust. If the yellow flag starts turning red, alert the bank and outline the consequences. This helps you prepare and for the bank to prepare. Procrastinating this step can result in devastating consequences. The bank may be able to help you if you give them enough time. Start identifying and tracking those KPIs that influence your debt covenants. For help and tips on how we measure KPIs, download our KPI Discovery Cheatsheet today! Know your numbers and where your company is the weakest so that you can start turning around your future. This formula can be very helpful in projecting how much time you have to find a solution to turn things around. Let’s assume you have $1,000,000 in working capital and are losing $100,000 a month. According to the formula, you will only have 10 months before you run out of cash. The trouble is, you’ve predicted the downturn to last up to 18 months. The character for the word crisis in Chinese is actually comprised of two other characters – danger and opportunity. The key to surviving, even thriving, during times of crisis is to find the opportunity amidst the danger. Your first answer to the crisis was probably to cut costs. Most likely, you’ve already done as much of that as you can so let’s look at some other ways to weather the storm. Examples of throughputs are hours worked, widgets produced, etc. Resources are people, materials, etc. Understand the processes – How do we do things around here? Identify and measure drivers – What’s really driving results? Identify bottlenecks & inefficiencies – What’s going wrong? Simplify the process – What can we cut out? Communicate to everyone – Everyone needs to be on the same page. Tie rewards to results – What gets rewarded gets repeated. If you’re worried that you’ll run out of cash before things turn around, it’s time to focus on reducing your cash conversion cycle. Lastly, you must measure cash flow on a daily, weekly, quarterly and annual basis. You can’t manage your cash flow if you don’t measure it! Want a step-by-step guide to improve your cash flow? 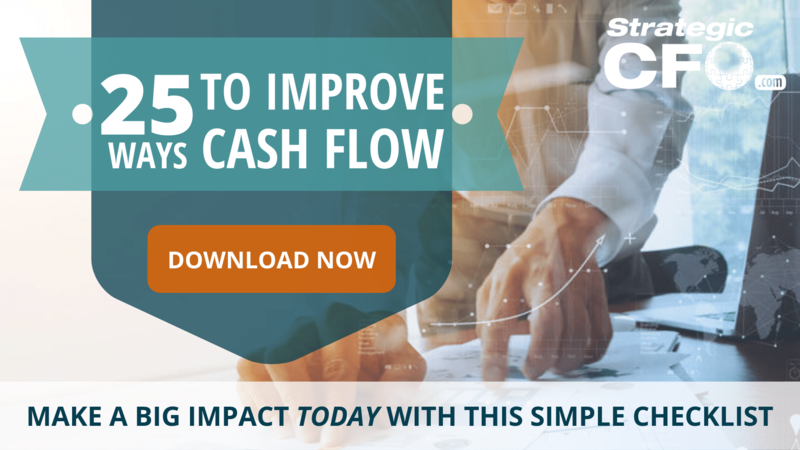 Download our free tip sheet 25 Ways to Improve Cash Flow. Your operating cash flows focus on the measurement of cash generated by your operations. This is the most important cash flow type to look at when experiencing a positive cash flow and a negative net income. Because a positive cash flow is able to maintain current operations and potentially grow the operations, operating cash flow could be the main determinant in why you’re running out of cash in a positive cash flow period. If you’re experiencing this, you either are hiring personnel and can’t avoid it, OR you’re experiencing collections problems and/or have poor debt structure. The bottom line of your operating cash flow determines whether your company will make a profit or not. This type of cash flow deals with the cash flowing between the firm and its owners. For example, any technology investments or meeting requirements (payroll, etc.) would be considered investment cash flow. This type cannot be controlled like the operating cash flow due to the investment of necessary items. If you’re experiencing this in your investing cash flows, look at your assets to determine if each asset is absolutely needed. The solution to an investing cash flow problem would be to sell some of these assets. In addition, consider raising capital to get over the hump. In the end, you need to be mindful of where your working capital is going. Managing your cash flow is just as important as growing your revenue streams. To learn more ways to improve your cash flow, click here to download our free guide. For more tips on how to manage your cash flow, click here.